We’ve lived in this house for 25 years, and I’ve wanted something on that wall for that entire time. Now I’ve got it! The idea behind the grid is that it makes it easy to move things around. 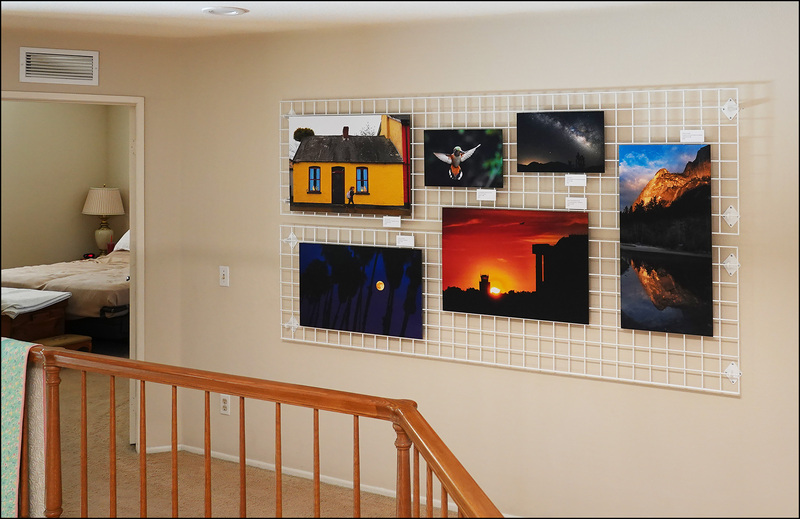 I can remove one or two pictures and replace them with new ones in just a few minutes, so the hallway becomes a rotating gallery of photos and a good way to learn more about printing photos. The Yosemite photo on the far right is fine. Hooray! The sunset picture next to it contains a lot of artifacts that I didn’t notice on the screen. I need to be more careful about introducing artifacts in Photoshop and more observant about seeing them before I commit to a final version. The two small photos at the top were an experiment: shooting at my highest ISO, can a small-sensor camera produce a decent 11×17 enlargement? The answer, roughly, is no, though neither one of them is really all that bad. But there’s no question that the noise is pretty visible if you get within a few feet. The purple moonrise at the bottom left was a disaster. I had to do a lot of Photoshop work on it, and I did it badly. I’m not sure if I’ll take another crack at it. It’s a tough nut. The yellow house is fine except for one thing: it’s the only print of the bunch where the color is way off. I’m doing the color correction myself and embedding the color space in the image, and that worked out fine for the others, which are very close to what they looked like on the monitor. However, the yellow house should be a much brighter yellow. I don’t know what happened here. I’d like a good print of the yellow house, but I’m not quite sure how to get it. Since I’m not printing the photos myself, I’d need to provide some additional instructions to the commercial printer I’m using, and I don’t know what those would be. But I figure I can learn. There are bound to be some good books or tutorials on color workflow and how to ensure you get the color you want. I just need to find them and get more practice.